Inspired by an ancient toy, researchers from Stanford University have developed an ingenious hand-spun paper centrifuge. Incredibly, the device costs just 20 cents—and it can be used to detect malaria in blood in just 15 minutes. A centrifuge is an essential tool for hospitals and labs across the world. Trouble is, centrifuges are expensive, bulky, and require electricity. In poor regions where tropical diseases flourish, these instruments can be hard to come by, thus limiting the ability of point-of-care healthcare workers to do their work. In an effort to overcome these hurdles, scientists have tried to create centrifuges from salad spinners and manual egg beaters, but neither kitchen item has proven capable of producing the required speeds. Now, as a new paper published in Nature Biomedical Engineering shows, a research team led by Manu Prakash from Stanford University has developed a paper-based, ultra-low cost, lightweight, human-powered centrifuge that’s got the right stuff. The device, dubbed the “paperfuge,” can reach spinning speeds of 125,000 revolutions per minute (RPM), and exert centrifugal forces equivalent to 30,000 g’s. It’s roughly a hundred times faster than previous non-electrical efforts, and it’s considered the fastest rotational speed ever recorded for a human-powered device. When testing for diseases, clinicians need to separate blood into different parts for further analysis. In demonstrations, the paperfuge was able to centrifuge blood at about 20,000 RPM—a speed comparable to those exerted by conventional benchtop centrifuges. The paperfuge was able to separate pure plasma from whole blood in less than a 90 seconds, and to isolate malaria parasites in 15 minutes. The design is based on a whirligig, or buzzer toy, that dates back to 3,300 BC. Variations of the device existed in ancient China, medieval Europe, the colonial US, and among indigenous North Americans. To make it work, a circular disc is spun by pulling on strings that pass through the center. 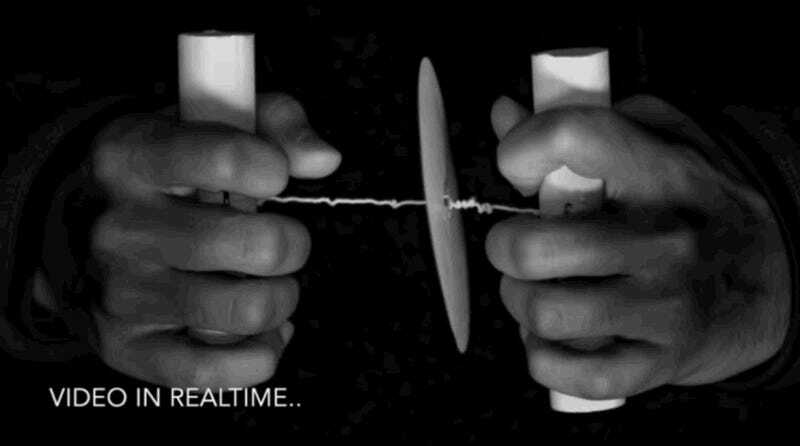 The paperfuge works according to the same principle, which the researchers describe as a “nonlinear oscillator.” Applying force to the handles unwinds the strings, resulting in rotation of the central disc. Once the strings are completely unwound, they start to rewind, forming a super-coiled structure. Above: Video showing step-by-step process of using the paperfuge. Importantly, the paperfuge can be constructed from different materials. At its most basic, the researchers demonstrated a version constructed from fishing wire, paper, and wood. Other versions were constructed from polydimethylsiloxane (a common silicon-based organic polymer), plastic, and 3d-printed materials, allowing for bulk manufacture. Field tests in Madagascar showed that the device can be used by basically anyone to perform basic, but vital, medical tests.